Negotiating your Small Parcel and Freight Contracts are vital to minimizing your transportation spend. UPS, FedEx, and DHL Small Parcel Contract Negotiations with Ship Watchers reduces your annual transportation spend an average of 13% for a "best in class" contract that may not have otherwise been possible without utilizing one of our Consultants that have years of billing and negotiating experience with the carriers. If you have had the opportunity to review a small parcel contract, you know very well that the carriers do a superb job at not giving you the full perspective. Small Parcel and Freight Contract Negotiations can be labor intensive and always come one-sided for the carriers. Addendums, Pricing Charts, Minimum Thresholds, Dim Weight Divisors, and numerous other accessorial surcharges must be taken into consideration and evaluated against historical and future shipping characteristics taking into consideration estimated rate increases. Our Network and Consultant Staff will guarantee additional savings through our Contract Negotiations and as a client of Ship Watchers for our auditing solution you qualify for substantial discounts. Shipping and Contract Analysis -	Comprehensive analysis of current and forecasted shipping characteristics will be provided and compared to industry standards for proposal purposes. Establish Bid Parameters -	Company and Agent work together to better understand Company environment and evolving requirements. Determine carrier negotiation strategy and establish goals. Setting up RFP Guidelines -	Agent will work with Company to develop RFP guidelines and bid documents for carrier solicitations and assist throughout RFP process. 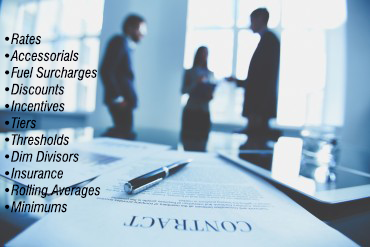 Carrier Negotiation -	Agent will work with Company to negotiate all bid responses analyzing over 130 parameters. Comparison Analysis -	Agent will provide Company with detailed bid response reports and comparisons with recommendations. The final carrier decision ultimately rests with Company. Implementation of Carrier Contract -	Agent will oversee implementation of new Carrier Contract and insure that any issues are remedied quickly while keeping Company informed. Carrier Compliance -	Agent will insure compliance of Carrier Contract terms and rates defined through constant monitoring and invoice auditing measures. Term of Contract Support -	Agent support is available 24/7 throughout the term of the newly negotiated Carrier Contract and any issues will be resolved in a timely manner. Ship Watchers relies on the experience and tenure of our Consultants that are comprised of former UPS, FedEx, DHL, and Freight Carrier employees that have obtained key resources, strategies, and industry knowledge through working in various carrier departments all related to billing and key account management. With the leadership of our consultants you are guaranteed a "best in class" carrier agreement due to our intelligence in carrier negotiating tactics, knowledge of historical pricing, discounts, and incentives provided by UPS, FedEx, DHL, and Freight Carriers along with our ability to decipher key transportation analytics, carrier trends, and carrier pricing agreements for domestic shipping rates and international shipping rates. Our contract negotiation efforts combined with our UPS Audit, FedEx Audit, DHL Audit, and Freght Carrier Audit will bring substantial savings, resources, and efficiency to your bottom line.